Grouping of outlets across multiple CDU’s. Individual Outlet Control, Current Load Monitoring, Power Monitoring, Additional Details. The Sentry POPS CDU is capable of being monitored and managed through the SPM (Sentry Power Manager) tool. Sentry POPS, in conjunction with SPM, provides additional power information including kW and kW-h information for billing purposes and power monitoring as well as trending and power reports. An ODBC compliant database allows power and other information to be exported to a Building Management System. ServerTech POPS Switched CDU products provide the capability to securely monitor power per individual outlet/ device. Power information per individual outlet /device includes current, voltage, power (kW), apparent power, crest factor, accumulated energy, and power factor. Using our grouping technology through Sentry Power Manager (SPM), power information is available per device, groups of devices (application), individual CDU or cabinet. POPS Switched CDUs combine networked configuration and management with power distribution and power and environmental monitoring. The POPS Switched CDU enables you to: control cabinet power via a network; reboot a single or dual power server with one command; receive SNMP-based or email alerts when power or environmental conditions exceed thresholds; and assign access rights to user groups or individuals. POPS Switched CDU products provide the flexibility needed for all data centers and remote sites, including power requirements for high amperage and high-voltage, EN 60950-1:2001 Branch Circuit Protection, and SNMP traps and email alerts including current monitoring. 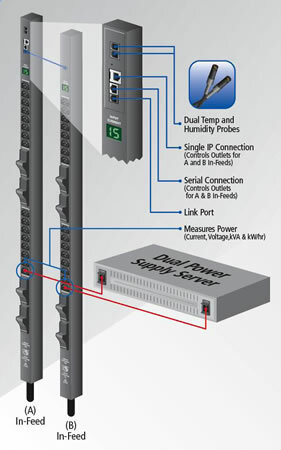 ServerTech Smart POPS CDU products provide reliable power distribution coupled with remote power and environmental monitoring. Use the network interface to view power, temperature and humidity levels via Web browser, or SNMP-based and email alerts when conditions exceed defined thresholds. POPS (Per Outlet Power Sensing) provides power monitoring per an individual outlet/ device. Power information per individual outlet /device includes current, voltage, power (kW), apparent power, crest factor, and power factor. Add an Expansion Module CDU to Smart and Switched CDUs. Link a master and expansion unit using a single IP address.